Money transfers and payment processes have long become everyday actions in digital public space without which our private life would hardly still be conceivable. This actually invisible movement, with which rights of disposal are transferred in the economic sense, is a message and medium of extraordinary power. The essence of this transaction is highly alterable: why should it not also be a performance in an artistic sense? With these customary functional card reader observers can carry out electronic payments of arbitrary amount to the benefit of the artist without receiving and kind of material value in return. 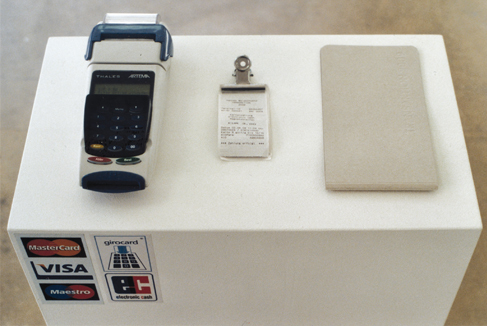 Following a successful payment transaction the printer embedded in the device produces a receipt.